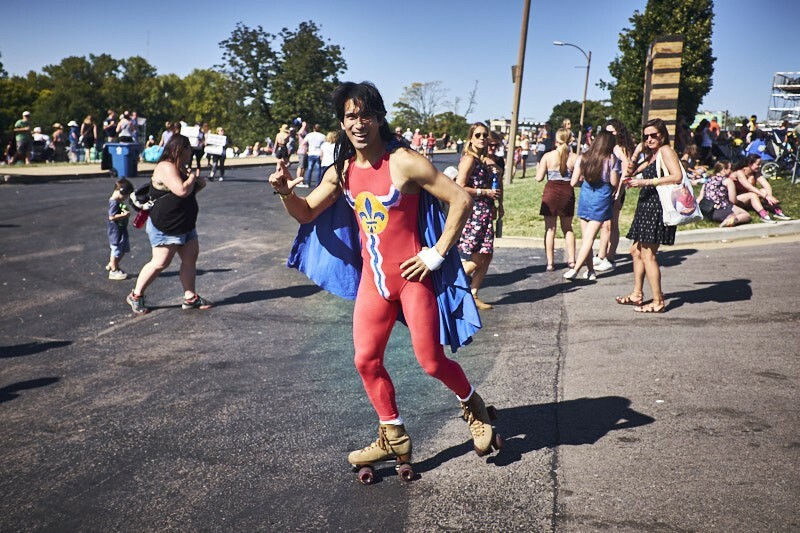 Obviously this man wearing a cape and St. Louis flag onesie should be filed under "best." For more photos from LouFest 2017, check out our slideshow here. Here we are again: hungover, sunburnt, and sleep-deprived — but generally satisfied — after yet another installment in the saga that is LouFest. 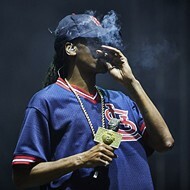 This year's LouFest — the eighth so far — reached 30,000 concert-goers showing up for Saturday night headliner Snoop Dogg, and likely matched that number for nerd rock veterans Weezer, who closed out the event on Sunday night. 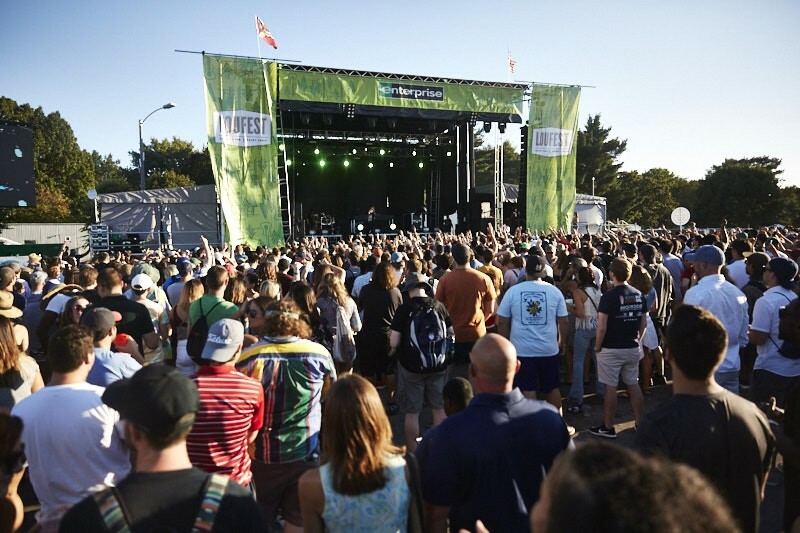 While this year's festival continued LouFest's year-over-year trend of steadily rising attendance (last year's festival hosted approximately 25,000 per night), and overall the weekend was a terrific time, it felt in some ways like a step backward. That could be due to ongoing renovations on Forest Park's Central Field (where LouFest had been held in past years), which forced organizers to move the event ever-so-slightly to the west, centering the festival grounds on the "Festival & Parking Plaza" (formerly known as the Muny's upper parking lot). Though the distance between the two venues is only a fraction of a mile, it created quite a sea change, restricting the amount of space available and swapping the usual verdant environs for an area dominated by an asphalt parking lot. The new venue did have its advantages, though — including built-in power sources, easier vehicular access, and less mess from mud and dirt. 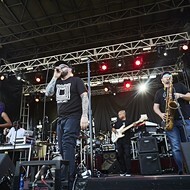 All in all, the new venue presented plenty of new experiences for festival-goers, both positive and negative. For the fourth year in a row, the weather on LouFest weekend was spectacularly, freakishly, mind-bogglingly pleasant, with clear skies, highs in the mid-80s and a nice breeze. Seriously, y'all, we are long overdue for some intensely untoward conditions. When this metaphorical rubber band snaps back, it's gonna sting. Hard. Yes, all of them. Sure, the national acts were top-notch — Run the Jewels had a whole crowd of people jumping up and down and ruining their ankles on the concrete, Lizzo brought an unapologetic element of social justice to her fiery afternoon set, Huey Lewis and the News was so ironically enjoyable that it lapped itself back to sincere appreciation again — but we're never going to not beat the drum steadily for St. Louis' finest acts. 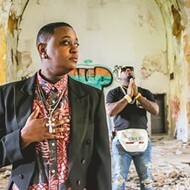 Check out our recap of all of the local performances here. Whereas last year's LouFest only featured video screens on the festival's largest stage, two of this year's three stages featured large screens to make the show more personal for those enjoying performances a bit further away from the stage. But it wasn't just the increase in quantity that made LouFest 2017's video elements one of its best features; this year's video team did an amazing job of capturing truly beautiful shots of performers that simply wouldn't have been visible from the audience. Heads thrown back in musical transcendence, fingers gently stroking keys, sweeping shots of the crowd as seen from the stage — this year's live video was enough to catch even the eyes of those just feet from the performers themselves. 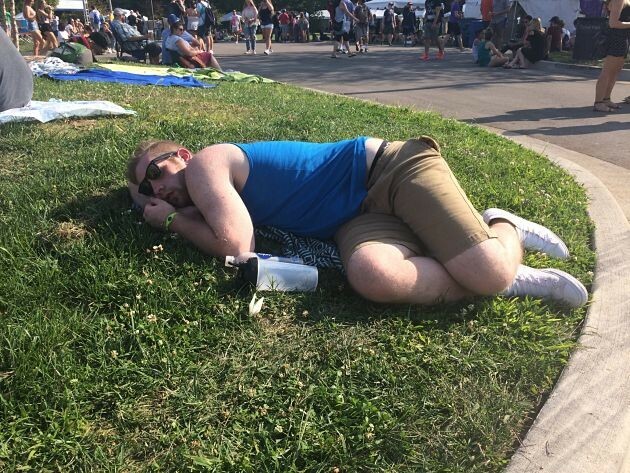 It isn't uncommon to spot people sleeping on the ground at LouFest, but the pavement this year made it look less peaceful-day-in-the-park and more oh-god-where-the-hell-am-I-and-what-the-hell-happened. This man passed out (died?) on the ground by 4 p.m. on Saturday. Cheers to this man. Because the Muny itself — and the parking lot on which the festival grounds were centered — is situated atop a sizable hill, planners were able to use the area's natural contours to create a sort of amphitheater in front of both the Bud Light Stage to the west and the the BMI-Tunespeak Stage to the east. The Enterprise Stage, meanwhile, sat at the top of the hill at the south end of the parking lot. This setup meant that each stage was acoustically separated from the two others, minimizing bleed-over and making the vendor areas more sonically pleasant than in years past. All the way back to Woodstock, contemporary music festivals have had a reputation for being wild, drug-fueled — and often debaucherous — affairs aimed firmly at an adult audience. With that in mind, you might not expect the kids' area of a music festival to be such a big part of the overall atmosphere at LouFest. 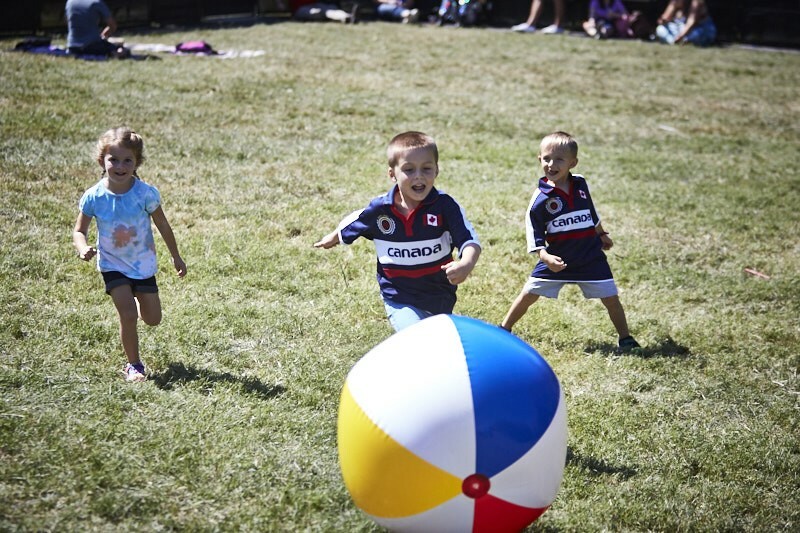 But for anyone who took the time to check out this year's LouFest Kidz area, there was a whole other sort of wholesome — and hilarious — entertainment. Attractions for the little ones included a giant chess board from the World Chess Hall of Fame, playable instruments from the School of Rock and lots and lots of bubbles. The best part of the Lou Kidz area, though, was the karaoke. Where else are you going to see a five-year-old take the stage with a professional sound system at his disposal and yell, "Are you ready to ROOOOOOOCK!?!?" before launching into a rousing rendition of "I Want a Hippopotamus for Christmas"? While it certainly kept things a little tidier (especially in comparison to the soggy quagmire that was last year's LouFest) the pavement this year was bad for the heat and worse for the feet. The weather was great, with highs only reaching a warm but pleasant 87 degrees, but the placement of the Enterprise Stage and all vendors on the asphalt parking lot meant that the actual temperatures climbed into a slightly less comfortable range. The hard, flat surface also made standing more or less a necessity to see acts performing on the Enterprise Stage, likely causing a spike in Google queries for "Dr. Scholl's" in the St. Louis area over the weekend. One of the most fun things about last year's LouFest was that, with 30 different food vendors, the festival's Nosh Pit was essentially a small food festival within a larger music festival. This year, though, organizers scaled back to only eighteen food vendors, fewer even than LouFest 2015's nineteen vendors. Sure, nobody went hungry, but considering the overwhelmingly positive response to last year's showcase of St. Louis's wide range of high-quality culinary options, the choice was a bit puzzling. Possibly the biggest disappointment of the weekend was the persistent sound problems on the Bud Light Stage, the festival's largest. During Saturday's first performance on stage by Mvstermind and his newly-formed band, mics failed no fewer than three times and — on his most recent single, "Ain't No Water In the Water Tower" — the backing track that accompanied the band simply quit playing mid-song. 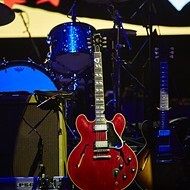 While it's understandable that there might be kinks to work out early on, the problems continued to occur throughout Saturday, with mic failures during Spoon's afternoon set, as well as failures to properly balance during solos by members of Jack Grelle's band on Sunday.